Flying from Paris to Asia is a chance to experiment many luxury airlines with first class low rates such as Emirates, Qatar Airways or Etihad Airways. For a trip to Shanghai we decided to choose the Etihad Airways first class – called Diamond First – with a stop at Abu Dhabi, a 15-hour journey that allows us to try the famous “mini suite” seat on both A340 and A330 planes. 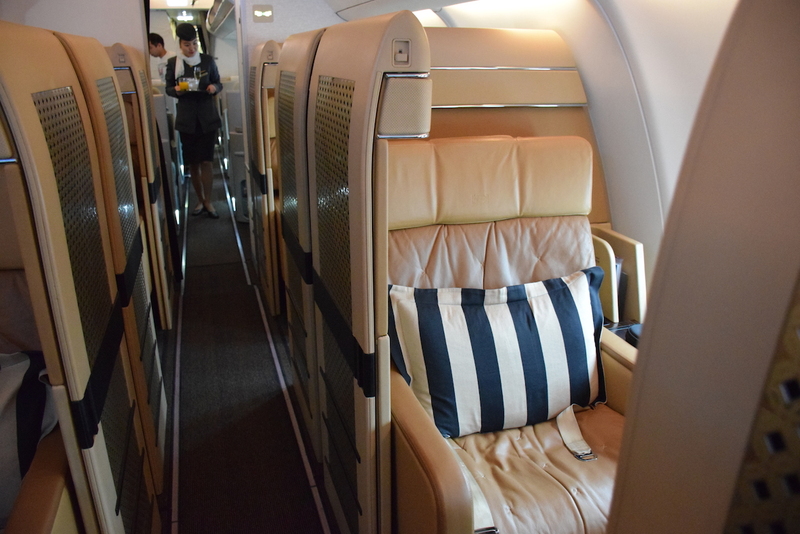 Indeed the company made the buzz weeks ago with the announcement of its future A380 bedroom, but the formal Etihad Airways first class in its mini suite layout is still renown and has been awarded many times by Skytrax, for instance. We have to mention ground services which are also really good: complimentary limousine transfer – upon request – at departure, arrival and for any stopover. Then the company invested a lot in Paris airport, opening a brand new lounge for its Pearl Business and Diamond First class passengers with dedicated restaurant, business center and private rooms. Regarding in-flight services, Etihad Airways is on top with a first class Chef dedicated to meal preparation, a multi-language and very well furnished entertainment system as well as a professional crew that take care of all your needs. For sure, flying Etihad Airways first class means unforgettable experience ! The A340 Etihad Airways first class cabin is a 1-2-1 configuration with the possibility for middle seats of lowering the partition panel – ideal of couples – and all of them have sliding doors offering privacy for passengers ; that’s why they call this seat a mini suite. Materials are luxurious – love the leather quality ! – with a very modern and epurate design in beige and dark wood tones, and a starry ceiling allows travelers to sleep in a dreamy sky ! 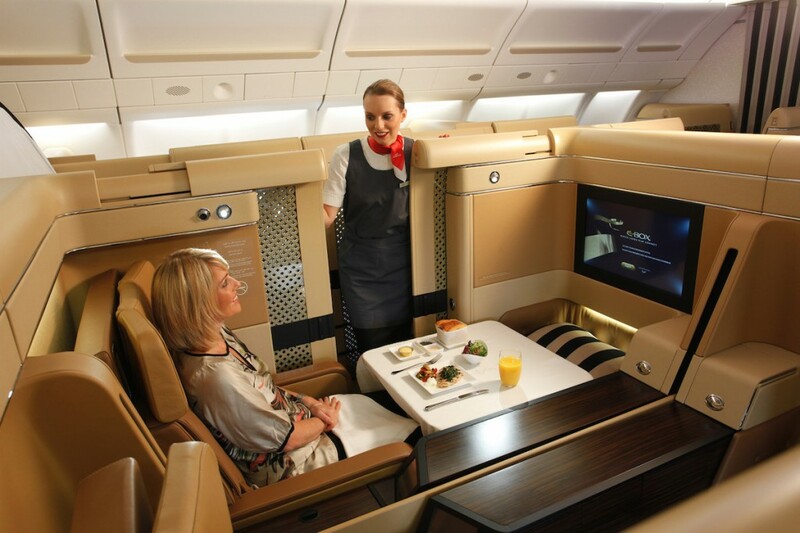 The seat itself is very large and comfortable with a 2-meter pitch, a wide 23-inch screen and many gadgets: USB/Ethernet/power plugs, a touch screen remote control, a private mini bar… For dinner, a convenient table enables to enjoy the a-la-carte dishes watching TV or let two passengers seating face to face. It clearly remembers us the experience we had with Thai Airways on a similar aircraft even if the Asian company was a bit higher in term of service quality. Catering was pretty good, we enjoyed a full dinner and a light breakfast ; thanks to our private first class Chef food was very well cooked and presented, as well as very tasty. Choice was quite eclectic – arabic, french, asian, italian, … – and wine selection very luxury, actually much more than expected. Two different crews are devoted for the table service: the Chef asks your preferences and brings your plates while a “standard” crew clear the table and the overall works fine. 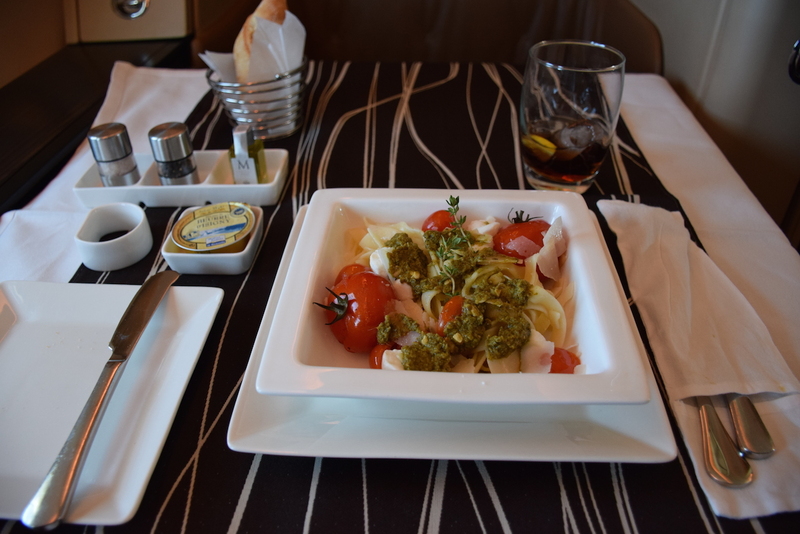 Also, I personally appreciated a lot the “kitchen anytime” menu which lets Etihad Airways first class passengers to order hot or cold dishes at any moment ; well, this is a luxury flight ! AUH to PVG, night flight on A340 in May 2014.